Romantically & emotionally expressive, stunning collection. The Perfect way to convey heart felt sentiment these figurines�are designed and sculpted in the United Kingdom. MEASUREMENTS -�Heights Various Depending On Figure. Proof of postage is kept at all times and all items will be sent well packaged. Payment via PayPal, Postal Order Or Personal Cheque (Item will be posted out as soon as cheque has cleared). Postage�overseas will be higher than stated and payments via PayPal Only. We are Approved Arora Stockists. Got a question? Message The Cake Miller. Returns accepted at cost to purchaser. Return must be unused and in original packaging. Refund of payment will be issued once item has been received. Romantically & emotionally expressive, stunning collection. The Perfect way to convey heart felt sentiment these figurines�are designed and sculpted in the United Kingdom. 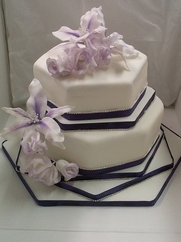 CONDITION - �Brand New MEASUREMENTS..
My cakes are deliciously moist and flavoursome creating an air of completion to your special day. The cake can be made up of 2, 3, 4, 5, 6, 7 or 8 tiers and are made to order to enhance your theme while..
A modern version of a bride and groom. This topper is made of food graded clay dough and stands at 10cm tall. There is a option of white or ivory. 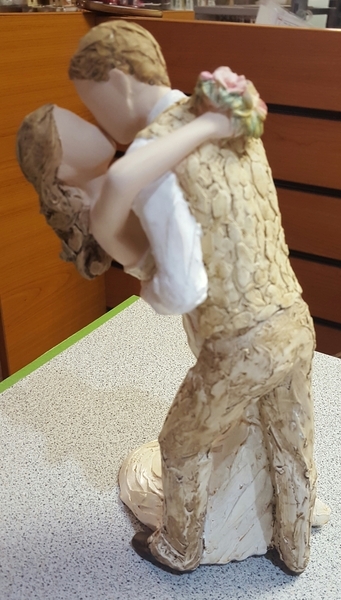 Food graded clay dough figurine, depicting a couple holding a "we do" banner, standing 15cm tall. A delightful winter bride in the arms of her groom. Made of food graded clay dough it stands at 12cm tall. Romantically & emotionally expressive, stunning collection. The Perfect way to convey heart felt sentiment these figurines�are designed and sculpted in the United Kingdom. CONDITION -�Brand New MEASUREMENTS..
Bride and groom with red bouquet. Height 16cm. Made out of food grade resin. A stylish addition to your cake, is the finishing touch that stands 13.5cm tall. 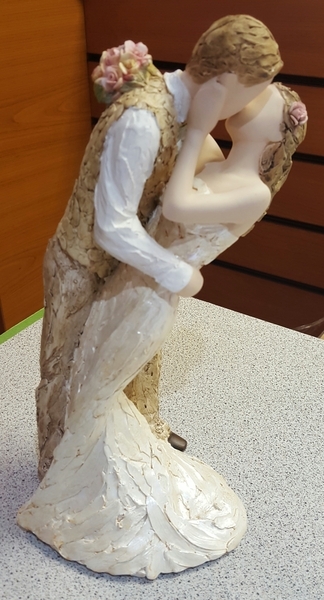 A wedding topper that is a pleasant addition to your wedding theme. Made of food grade resin, it stands at 18.5cm. Made of food graded Clay Dough that is a wonderful touch for your special day. It is 13.5cm tall. Romantically & emotionally expressive, stunning collection. The Perfect way to convey heart felt sentiment these figurinesÂ�are designed and sculpted in the United Kingdom. CONDITION -Â�Brand New..